What Are the Best Shampoos for Cats? Cats don’t usually require baths. But when they do, you need to be armed with the right information. Turns out Agatha Christie spent a few days at the Kitty Kennel while my friend was out of town. Agatha came home from the kennel smelling foul, so my friend decided she must have a bath before either of them could sleep. The bubblegum-pink shampoo she chose should have been a nice luxury for Agatha. Unfortunately, Agatha has dry, brittle fur, which absorbed the dye in the shampoo. Agatha Christie turned out looking like a ball of cotton candy. My friend loves her cat, but in her haste she neglected to read the product label. She purchased the shampoo because of a pretty color, not because it was the right product for the job. So what is the “right” product? Even though the label on your kids’ shampoo claims that it’s gentle, it’s not the right choice for your cat. For example, looking at the ingredient list for Johnson & Johnson’s No More Tears shampoo, we see that it contains sulfates and dyes, both of which are big no-nos in pet shampoos. When I did some poking around, I found that many shampoos claiming to be “all natural” actually contained dyes and sulfates. Finding the right shampoo wasn’t going to be easy, but I did find Wondercide Natural Products Exfoliating Natural Shampoo Bar (affiliate link). Yes, it’s a bar soap, but this actually may work better for you at bath time, giving you more control over where the shampoo is distributed and making it easier to avoid eyes and other sensitive parts. The best part? Not a sulfate, paraben or dye to be found in the ingredients. It’s not uncommon for cats (especially seniors) to develop sensitive skin and irritation. Cats are natural groomers who spend much of their time keeping themselves clean. Because their skin is so often wet, it can get irritated. Shampoos that contain natural oils can help. Both chamomile and aloe vera help nourish the skin and fur and relieve itching. If your cat develops sores or skin irritations, remember to check with your veterinarian before trying anything new. This ensures that you are catching any infections that may be lurking. As the proud mom of a cat who is literally half hair, I can tell you that cats both shed (a lot) and get mats if their coat is not properly groomed. Shedding is more common in the spring and summer months, but you’ll see it happen all year long. One way to effectively help decrease the cat hair in the house is to brush your cat frequently. While this can be challenging, it makes a huge difference by removing hair before it ends up creating tangles and mats. You can also get a detangling shampoo or spray. FURminator has a waterless spray (affiliate link) that helps control matting in both dogs and cats. It’s a pretty safe bet that your cat is going to encounter fleas, ticks or both during his lifetime. Luckily, the solution here is simple: Dawn dish soap! 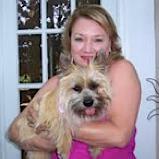 Dawn is considered by many to be a natural flea killer and gentle enough on skin to not cause irritation. 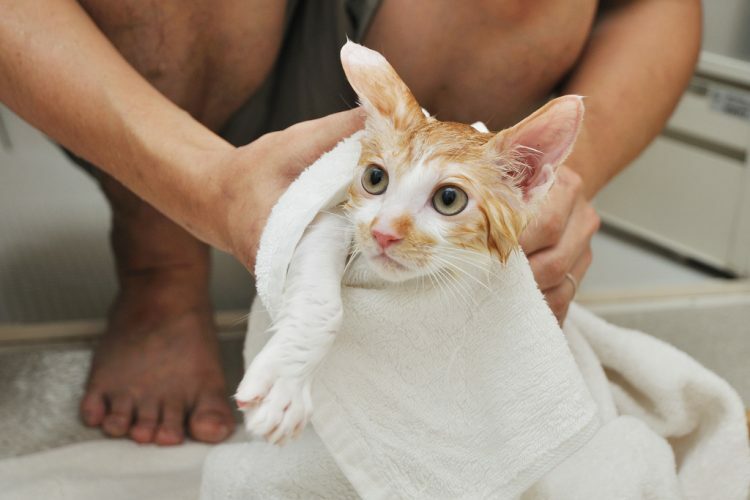 Simply put your cat into a bath with warm water and couple of drops of Dawn dish soap, and scrub away. You may have to repeat this several times before the fleas are entirely gone, but Dawn is gentle enough that this shouldn’t be a problem. 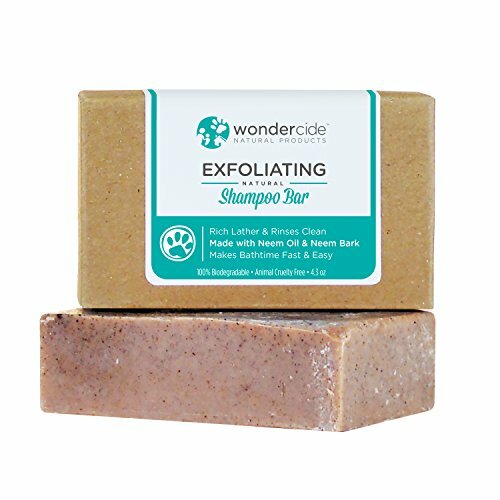 If you’re not comfortable with Dawn, try Wondercide’s Flea & Tick Natural Shampoo Bar (affiliate link). Reminder: Any time you want to try something new on your pet, check with your veterinarian first. Also, know that bathing a cat too frequently may cause more harm to the animal than good. Use all available resources to your advantage to avoid the catastrophic results Agatha Christie suffered. By the way, the cat’s bad dye job eventually faded away, but she still hides under the bed at the slightest flash of pink. Editor’s Note: Melissa Smith contributed to this article.